Sculpted in the inimitable. Based on the highly popularJustice League Unlimited animated series. YOU WILL RECEIVE ONLY WHAT IS SHOWN IN PICTURE. THIS ITEM IS IN GOOD CONDITION WITH MINOR SHELF WEAR (SEE PICTURES). It has never been displayed or used. Based on the highly popularJustice League Unlimited animated series. DC Universe Justice In The Jungle B'Wana Beast & Animal Man. When there's trouble in the jungle, B'Wana Beast and Animal Man are the heroes to have by your side! For the Adult Collector. DC Universe: Justice League Unlimited Animal Man. Released in 2011. Complete and in excellent shape I literally just removed him from original box right before taking picture. Great item for your collection! FREE Trial! We have a nice selection of DC Universe Infinite Heroes Crisis action figures. This is Number 14 three pack featuring Animal Man, Starfire, and Adam Strange. It is brand new in the box as shown. There is a small sticker pull on top. He is in excellent condition with tight joints and no paint wear. Animal Man. This is very important! I will do the rest for you. DC universe JUSTICE LEAGUE UNLIMITED. Condition: overall excellent. nice paint, nice joints. YOU WILL RECEIVE WHATS SHOWN IN PICTURE. DC universe JUSTICE LEAGUE UNLIMITED. ANIMAL MAN. DC Universe: Infinite Heroes Animal Man. Released in 2010. He is in excellent condition with tight joints and no play wear. DC Infinite Heroes Animal Man. I will do the rest for you. This is very important! 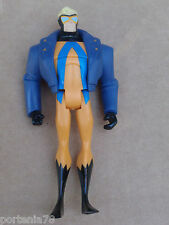 JLU JLU Animal Man. He is in excellent condition with tight joints and no play wear. This is very important! I will do the rest for you. 2009 ANIMAL MAN. 100% COMPLETE. 2009 DC Universe Classics B'WANA BEAST ANIMAL MAN Justice In The Jungle 2 Pack. Condition is New. Shipped with USPS Priority Mail. With bold colors and dramatic detail, this line features your favorites along with a whole army of heroes and villains. scale, providing collectors a new scale to collect their favorite heroes and villains.